This fall, some proposed changes in the way hospitals and other healthcare facilities report data to the Centers for Medicare & Medicaid Services (CMS) may take effect. Many news articles covering these proposed changes seem to indicate that critical public access to this data, specifically, the Hospital Compare website, may stop providing up-to-date HAI statics, or may even cease to exist altogether. While no final rule has been published, we were able to secure a response from CMS about their plans for Hospital Compare. Today's post will present their response. First, some quick background for those of us who are not familiar with the reporting responsibilities healthcare facilities face. Currently, subsection (d) hospitals (general, acute-care, short-term hospitals) that receive Medicare reimbursements (that is, they treat individuals covered by Medicare) must in turn participate in the various data collection programs. This includes data being sent to the National Healthcare Safety Network, run by the Centers for Disease Control and Prevention (CDC), which then transmits the data to CMS for use in programs such as the Hospital Inpatient Quality Reporting and Hospital Acquired Condition Reduction Program. Some reports are due monthly, others are due quarterly, and penalties apply to those facilities who do not send in complete data and those whose rates fall in the bottom quartile of facilities for that year. It's an enormous task, but one that generates mountains of critical data that helps hospitals in quality improvement, ensures transparency in healthcare, and allows patients to research facilities in advance. One of the most front-facing forms of that data is Hospital Compare, a website operated by CMS that is accessible to everyone. CMS publishes data for each facility, including VA facilities, across many categories. For each facility, you can find up-to-date information on hospital size and inspection status, electronic lab capabilities, timeliness of care, outcomes of a variety of procedures, rates of complications, use of advanced imaging technology, and medicare payments. To populate this website, CMS draws from a huge array of reporting programs: IPPS, CASPER, CART, EPRP, NHSN, IQR, HVBP, HRPR, HACRP, VHA, CDC, HCAHPS, and SHEP. 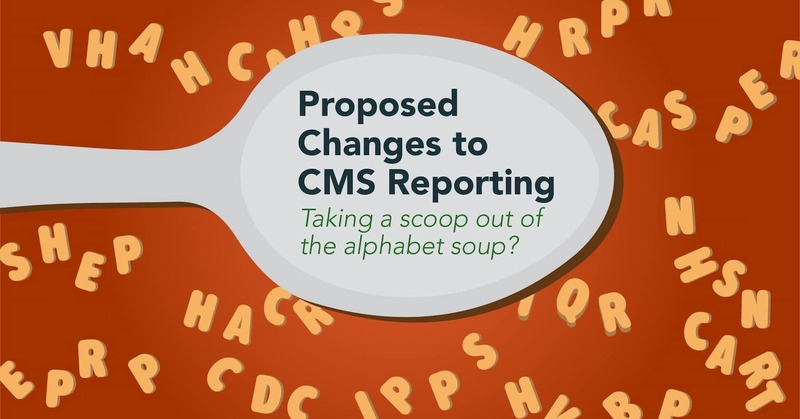 This alphabet soup comprises reports to a variety of endpoints, and some of those reports are, according to CMS, needlessly duplicative. And this is their central intent with the proposed changes to the final rule: "de-duplication of measures across 5 hospital quality reporting programs," not the elimination of reporting across the board. To this end, CMS proposes eliminating some measures from the Hospital IQR program, while retaining them in the other value-based purchasing programs. According to a CMS spokesperson, "CMS [does] not propose to suspend public reporting of these safety measures on Hospital Compare." Therefore, while the Hospital IQR may no longer require CAUTI rates, the HACRP still requires those rates, so CMS will receive those rates via that report instead. The reasoning behind this proposed change is to eliminate needless duplication in reporting, saving time and money in the process. However, CMS continues to welcome public comment on the proposals before they finalize the regulations. And even after the final rule is posted, CMS will "reconvene a Technical Expert Panel to advise the agency on the impact of removing any measures," including whether any changes should be made to the Overall Hospital Star Ratings on Hospital Compare. Do you have an opinion about what these proposed changes might mean to healthcare and HAIs? Do you have questions or concerns? Please share your thoughts with us here. We'd love to know your reaction to this developing story.